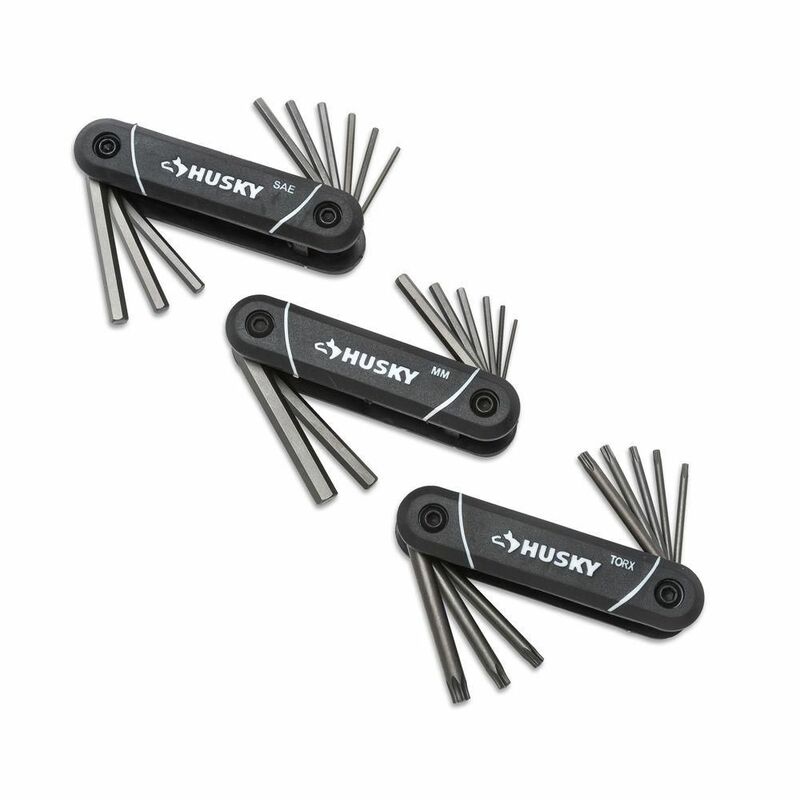 The Husky 9-Piece SAE, 8-Piece Metric Hex Key Sets and 8-Piece Torx Key Set are designed to tighten and loosen hex and torx fasteners. All folding key sets feature a comfortable grip for non-slip usage. The keys are made with harden steel and have a flat-end, industrial-quality design. SAE sizes: 1/4, 7/32, 3/16, 5/32, 9/64, 1/8, 7/64, 3/32 and 5/64 in. SAE/MM/TORX Folding Hex Key Set (25-Piece) The Husky 9-Piece SAE, 8-Piece Metric Hex Key Sets and 8-Piece Torx Key Set are designed to tighten and loosen hex and torx fasteners. All folding key sets feature a comfortable grip for non-slip usage. The keys are made with harden steel and have a flat-end, industrial-quality design. SAE/MM/TORX Folding Hex Key Set (25-Piece) is rated 4.0 out of 5 by 1. Rated 4 out of 5 by mcube from Good product I bought this product about a month back mostly for my bicycle. The multi-size works well with different sizes of hex nut in bicycles. Easy to use, sturdy, feels good in hand. A bit too heavy to put in saddle bag.